Fluff is a dice game from 2-4 players from Bananagrams. 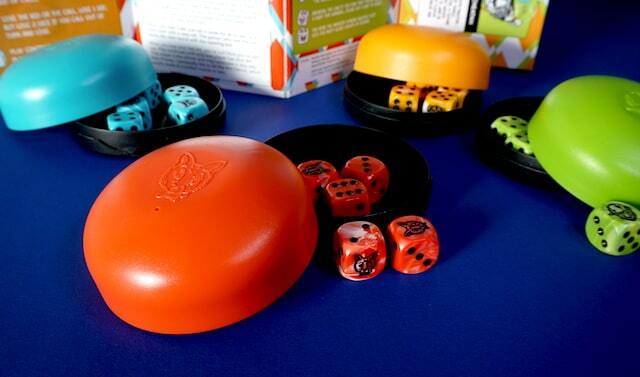 It’s actually the two-hundred-year-old game Liar’s Dice with adorable but shady looking critters and clever dice cups. It also happens to be one of Claire’s favorite games. Listen as she tells you why, or read on below. Each player gets a dice cup with 5 dice. Shake them up and then peek secretly at them. Then the first player places a bid – a guess as to how many dice all players have at a specific value. Animal faces are wild. So if you have 1 wild & 2 twos, you could easily say “3 twos”. Next player must raise the bid, or call “fluff” to call the last player’s bluff. Or of course, you could raise both. You may lower the value if you raise the quantity (7 threes -> 8 twos). Quantity (how many dice) may never decrease. Not convinced the last player was making a bid that works? Call “Fluff” and everyone reveals their dice. If the bidding player was wrong, they lose one die. But if they were right, the player who called “fluff” loses one! Keep playing until only one player has dice left. That player wins! Fluff takes a timeless classic with easy to understand rules and gives the components a solid upgrade. 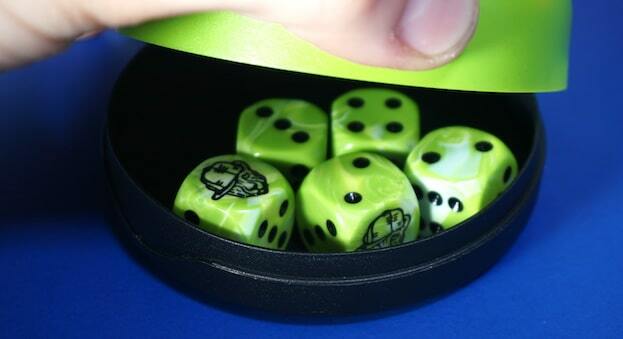 Each of the four colors has its own shady character, printed on the dice cup and on the dice themselves (in place of the 1s). The box unfolds to show the instructions and the characters’ names: Don Whooligan (owl), Ricky Foots (racoon), Von Slyster (fox), and our favorite – Wicked Cheetah from South Pawston. 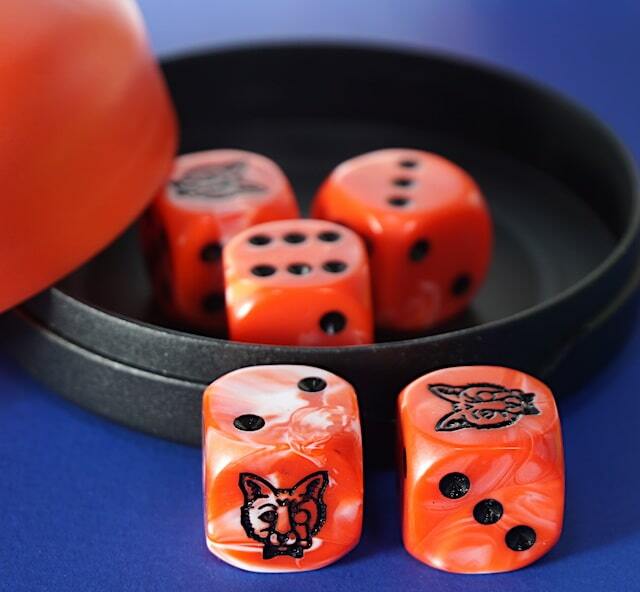 The dice themselves are beautifully made, marbled and with just enough roundness to get a good roll within the cup. Kids will be drawn in by the simplicity and the creative characters. There’s not any fighting for first player, instead it’s a rotating reward to the person who last lost a die. The dice shaking gets a little loud, but otherwise this game is appropriate to play pretty much anywhere. Find Fluff at your friendly local game store or on Amazon for about $12. We give it 3 ½ cunning critters. The Family Gamers received a copy of Fluff from Bananagrams for this review.